The ship was built with one purpose: to provide the most luxurious and immersive experience in World Heritage’s Ha Long Bay. With a design that combines elegance with local artifacts and regional touches, Starlight Cruise offers an unparalleled setting for your exotic odyssey. 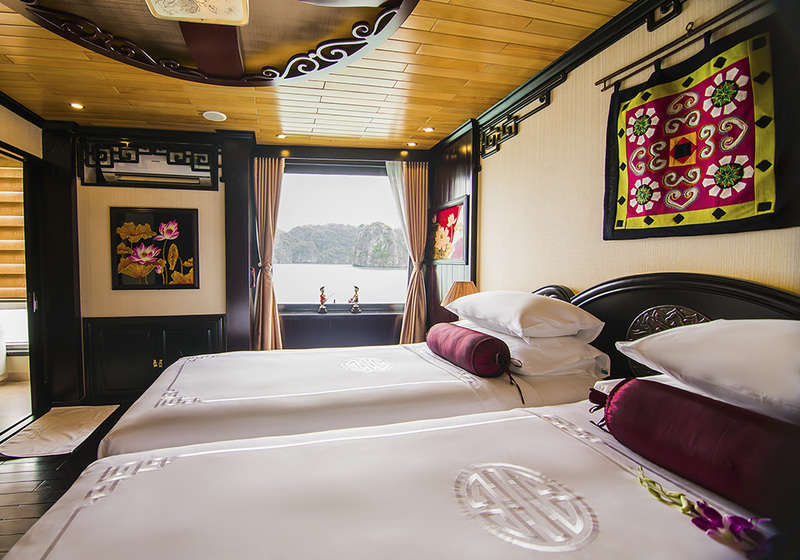 Starlight Cruise Ha Long was launched into service in July 2013 and from that day, international and Vietnamese travelers had another choice for luxury experience on Ha Long Bay. Over the time of development, Starlight Cruise is a popular luxury brand name for any looking for a sumptuous odyssey. 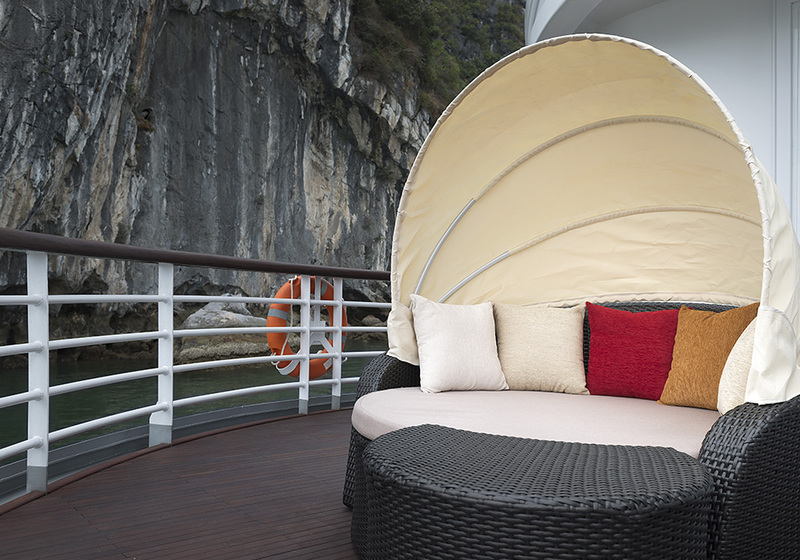 The ship’s priority has always been to maximize the enjoyment, convenience and comfort for you. The ship’s exquisitely decorated 32 spacious staterooms feature all the amenities of a fine hotel, with a large bed, a cozy sitting area, individually controlled air-conditioning, mini-bar, safety deposit box, in-house telephone, bathroom with shower, bathrobe slippers, hairdryer and in-house television. Pick-up at hotel and start the 3 hour-and-a-half drive to Hong Gai Tourist Wharf, check in Oriental Sails JSC’s private waiting hall – The OS Lounge. 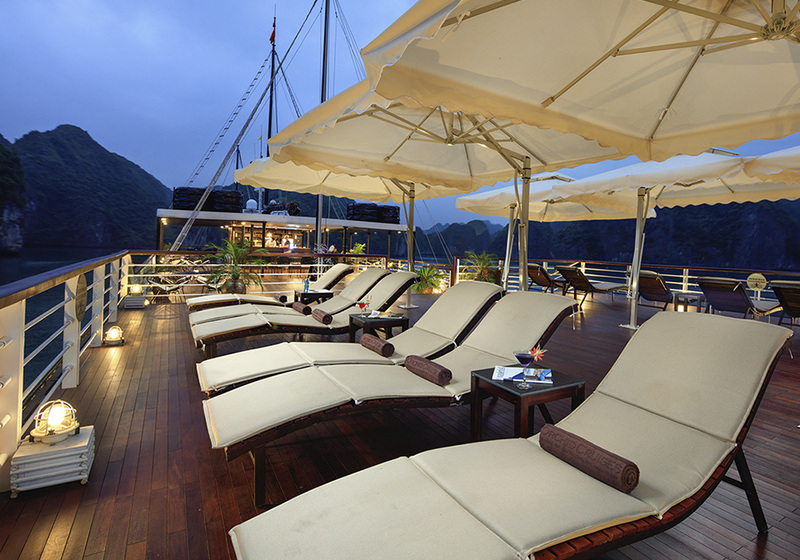 Embark on main cruises by a transfer boat. Listen to cruise briefing and receive room key. Savor a delectable lunch on Oriental Sails cruises’ restaurants further along the limestone islands of Bai Tu Long Bay, heading to the first place for activities. Option 2: Take kayak at by yourself with the help and instruction of our tour guides around the Village. Return to overnight cruises and have bath then relax as the sun starts to set. Enjoy the Happy Hour at the bar and on the sun deck while joining the cooking class with our chefs. Dinner is served. Socialize with other guests, night squid fishing or just laze around. Singing and dancing activities are available till 22h00. Overnight on board at Cong Do Area. Start your day with Tai Chi exercise on the sundeck. Check-out room. Luggage can be delivered to the reception area. Head back to the Harbor. Have early lunch on board.Disembark the main cruise at around 12h00. Savor a delectable lunch on StarLight cruises’ restaurants further along the limestone islands of Bai Tu Long Bay, heading to the first place for activities. Start your day with Tai Chi exercise on the sundeck. Enjoy a cup of coffee or refresh yourselves in Bai Tu Long majestic Bay. Have breakfast in the restaurant. Discover Bai Tu Long bay by one-day itinerary on our professional day boat. 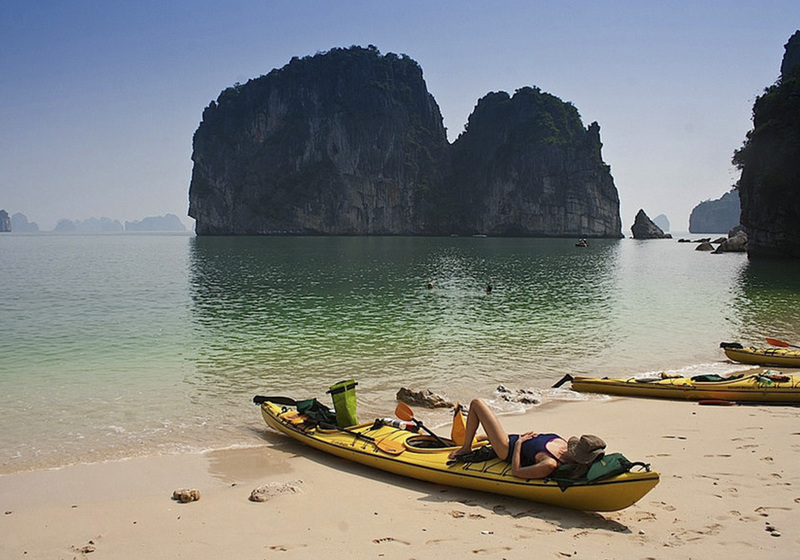 Cruise toward Tra San, Vung Ha Island where tourists can go kayaking, and catching beautiful sights and enjoy the wild, bewitching nature with many limestone islands, lovely small beaches. Have lunch on our day boat at Vung Ha area. Transfer back to StarLight Cruise. Have dinner and night activities on board. Over second night on board at Cong Do area. Head back to the Harbor. Have early lunch on board. Disembark the main cruise at around 12h00. Private dinner (in cabin, on sundeck, in wine cellar, etc.) with service charge of 10$/person. Paddling around the islands then stopping by a wild beach to enjoy seafood barbecue is your sophisticated moment in your trip. Enjoying fully the feeling, you are the only people with a fabulous meal on your own private beach in one of the heavens on Earth. Starting with a glass of wine and proceed to enjoy an array of succulent, grilled seafood. The melodious melody of the waves and blue sky will get paradise close to you. Total Area of 350 m2, including performing stage, bar, viewing front deck and balcony, indoor area is surrounded with panoramic windows for great Bay view. Surcharge $32/adult, $27/child on Dec 24 & 31, 2019.